A unique piece with eight hands and in the Jatamandala both Goddess Ganga and crescent moon is carved skillfully. The right hand carries parasu, damaru, and chakra and the stick while the left hands hold the deer, agni, bell and a vessel. ‘Yajnopavita’ is visible. The body of his dead consort Sati is on the left shoulder. Shiva is in a ferocious attitude. The divine attendant with bugle in hands mourns the death of Sati. 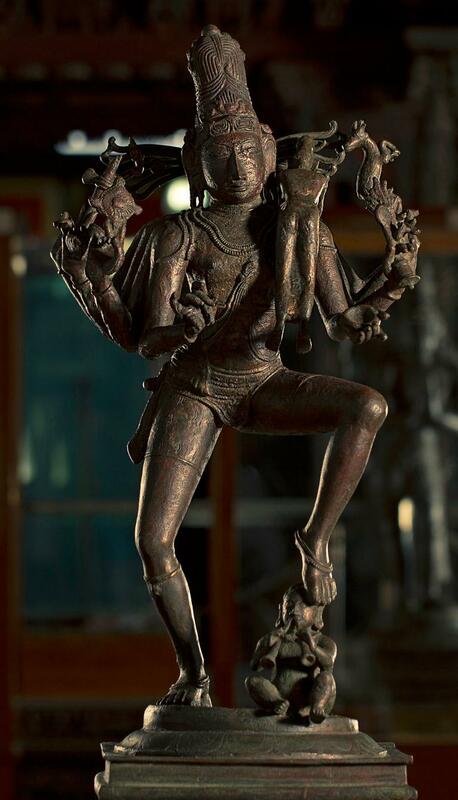 The left leg of Shiva is placed on the head of the attendant.